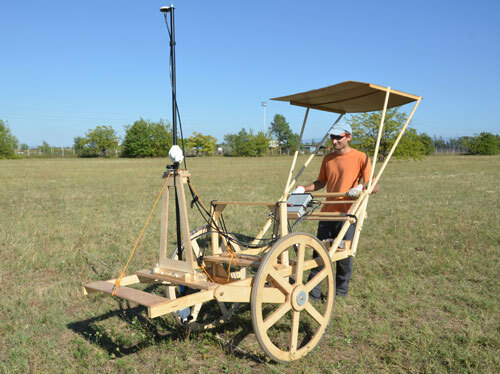 Leonard is a multipurpose cart, built with non-magnetic materials (wood, nylons, brass and bronze), suitable for magnetic and electromagnetic surveys. The particular construction type permits its use on any type of area, also dirt and rough, guaranteeing the stability of the instrumentation and the acquisition geometry. Considering a 1 Hz acquisition frequency (typical for extensive magnetic and electromagnetic surveys), Leonard permits the acquisition of 10-15 km per day with 1 m spatial resolution. Leonard is customizable and adaptable for any surveys or needs.